Emotional abuse often goes unnoticed because it leaves no visible scars. 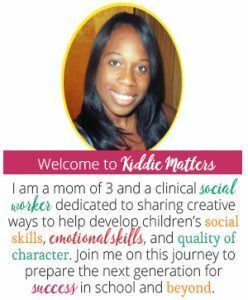 In honor of Child Abuse Prevention Month, today I’m sharing my experience with emotional abuse. 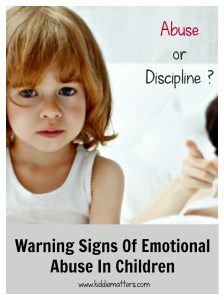 I’ve also included warning signs of emotional abuse in children. I could hear her screaming downstairs through my closed bedroom door. She was in another one of her rages and I was her target. “You don’t do anything around here! You are lazy and nasty. All you do is read and waste the electricity!” I tried to tune her out. However, every word she said cut through me like a dagger. I wanted to disappear to a place where her words couldn’t hurt. A place where I was loved and wanted. Occurrences like this happened on a regular basis when I was a child. No one thing would set my mother off. Sometimes it was because she didn’t like how I did a chore. Other times it was because she didn’t like my attitude. Sadly, I believed the mean things my mother said about me. After all, she is my mother. It never dawned on me that what she was doing was emotional abuse. According to Prevent Child Abuse America, emotional abuse is a pattern of maltreatment by parents or caregivers that leads to impaired psychological growth and development. Abusers constantly reject, ignore, belittle, dominate, and criticize their victims. This is more than just a parent having a bad day or using poor judgment when disciplining a child. For example, when I misbehaved, my parents wouldn’t speak to me for MONTHS. They pretended I was invisible and would communicate with me by sending messages via my little sister. My mother would be spiteful. She would get McDonald’s and call my younger siblings to eat in her bedroom. I had to eat whatever I could find. My mom would even tell my little sister not to share with me when she tried to sneak me food. Experience academic difficulties (poor grades, chronic truancy, etc). Children don’t always talk about what’s going on in their home. Many kids are taught that whatever happens at home stays at home. Some children don’t report emotional abuse because they fear it will make the abuse worse or get their abuser in trouble. Sadly, there are also kids who believe that their parents’ emotionally abusive behaviors are the norm. These children need someone in their lives who can recognize the pain they are in so they can protect them. If you believe that a child is being abused emotionally or otherwise, please contact your local Child Protective Services Agency. If you believe the child is in immediate danger, call 911 immediately. You can find additional information on Child Abuse Prevention Month here. My heart hurt for your experiences growing up, but you have used that pain to help so many people. This is an excellent point, and a good reminder to every parent to think very carefully about the impact that his/her words have on their child. Thanks Stephanie! I appreciate your kind words 🙂 The damage from emotional abuse lasts a long time. I’m hopeful though because so many survivors have the courage to bring awareness to something most people want to ignore. Wow! You’ve overcome a lot! Your post is very informative. Thank you for sharing your story. There are so many scars we never see. I love this list. Thank you so much for sharing. This is such an important topic. I am sorry for all you went through, but am thankful that you are willing to share so that others can learn. Wow, its not often that I am around kids that I could assess these behaviors, but when it comes time that I have my own children I will have to keep these in mind to ensure they and their friends are not affected by such a thing. Thanks for sharing this list. I can’t even imagine what’s going on in the head of one of these poor kids. As a teacher I can tell you when I encountered what I thought might be emotional abuse I would do all I could to make sure that child felt valued and loved in my room. That was a hard post to read, but I hope you posting this can help someone. I cannot imagine a mom not showing their daughter all the love in the world. I hope you continue to be that strong woman! This touches my heart so much. I hate that you or anyone goes through this. Thanks for bringing awareness and hopefully help stop anyone else from going through it. Holy Hannah! I am so sorry you went through that. Every child deserves to feel loved and safe. Thank you for sharing your story. So often people forget that abuse isn’t just physical, it is also emotional. As others have mentioned, every child deserves the right to grow up in a home filled with love and support. so sad. This is something I never want my daughters to experience. It is our job to build up strong women! The more awareness the better. There are warning signs that are often missed. Sadly everyone that works with kids needs to and should be trained on this. Oh abuse, emotional or otherwise, makes my heart just ache. I’ve seen first hand what it does to a person and I hate to think children are still going through this! Thank you for sharing your story. It certainly does make you think about the words you use and the tone. Thanks for reminding us. Hugs! This is definitely something that needs more awareness. I think that a lot of kids do not know how to process this abuse, and are unable to know what it is exactly, they just feel extreme hurt and shame. I’m sorry you had such a rough experience in your childhood. 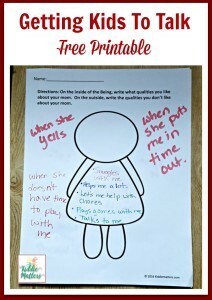 Thank you for sharing these important signs for what could be emotional abuse. Some of them I wouldn’t have even thought of being a sign. Thanks for sharing. I used to work in daycare, and there were a lot of kids who showed these signs. It was awful that there wasn’t a whole lot we could do for them without hearing a full story or seeing evidence. So sorry you experienced this. I hope your blog reaches a lot of people and helps them. This is so brave of you to share your story. and my heart goes out to you. As a teacher we are always looking to understand our students and their families. Many times people only focus on one type of abuse…but abuse is abuse whether physical or verbal..
I’m so sorry for the awful treatment! But I’m glad you are so brave to speak out and help further this cause by bringing awareness to it! You are so brave for sharing your story…thank you! Emotional abuse is such an overlooked part of abuse, but the effects are very real and long-lasting. I was emotionally, physically, and sexually abused from the day I was born until I finally left at age 18. I was even afraid to leave. A friend had to force me. I had been paying rent to share an apartment with her after graduation for 4 months before she helped/made me move in. I no longer have the lack of self esteem but I live with anxiety depression and shyness. It has stolen my life. I am 58 years old and have a high IQ but remain unsuccessful despite a lifelong work and struggle to achieve. It’s the damages from the abuse that hold me back. Other people and I can’t relate as they expect relating to go. I find a lot of people still abusive in usually passive aggressive type ways but also in downright rude and exploitative ways. I’m never that way to anyone. That’s why I at least have self esteem. Thank you for being so vulnerable! I appreciate your honesty in an effort to raise awareness for others! Hi, I don’t really know where to start…. I have 3 children that are being mentally abused by their stepmom to the point they have gotten on antidepressants. I have had the kids in therapy for over 2 years who are advocating that the stepmom have no accesses to the children . However, we are in Texas and other lawyers and their therapist all day for emotional abuse a judge won’t keep away the wife because they are married. The things she says , tells the kids , call the kids etc the therapist have some of it verbatim and it’s awful . It never stops! My kids are getting to the point of no return and I have spent weeks trying to find more outlets and help from people who are advocating about it and not concentrating on physical etc… Not that that’s not VERY important. I am a desperate mother who is going against and narcissistic ex-husband and a wife that is very brazen, no filter, knows no boundaries but can play a very good role when it needs to be. Anything you could give me …. I want the word to get out about the seriousness of this and help me maybe show along w/the therapists the effects it really has. He refuses to let them participate in after school activities, extracurricular activities, friends bdays …….I want to protect my kids because I went through both physical and emotional abuse growing up and I swore I would NEVER allow this to happen to my kids . Hi Sarah-I’m so sorry to hear that you and your family are going through this. Narcissistic abuse is insiduous and its effects can take a lifetime to heal. There aren’t many scientific studies done on narcissistic abuse, however, many mental health professionals have written about it. For instance, psychologist Karyl McBride has done a lot of work in this area. She also works with narcisstically abused children in a residential treatment facility. I’ll leave a link to one of her articles. Here’s another article by a psychologist as well.